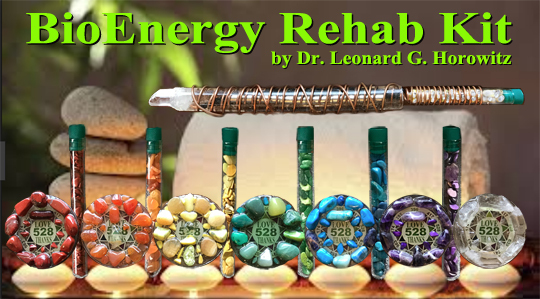 Own a Fabulous Healing Instrument, the "BioEnergy Wand". Technology Pioneered by Award-winning Health Science Expert, Dr. Leonard G. Horowitz. Image shows a finished BioEnergy Wand. 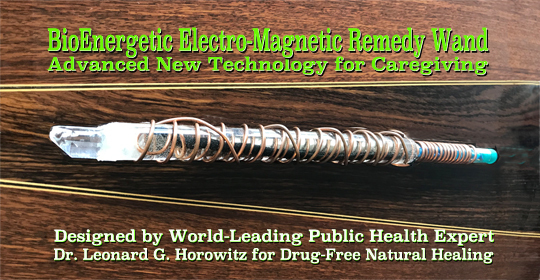 Energy Medicine pioneer and Frequency Therapy expert, Dr. Leonard G. Horowitz, studied Nikola Tesla and Royal Rife's brilliant works to advance this most wonderful natural healing and care-giving technology. This equipment bio-energetically reduces, often eliminates, common aches and pains while balancing chakras and rehabilitating the flow of energy through acupuncture meridians. Shown above is a demonstration of how to use this BioEnergy Rehab Kit. It starts with your personal 'biofield" of energy that you will leverage using the BioEnergy Wand designed by Dr. Horowitz. You see that one hand holds the wand, and the other only the handle. That creates an energy flowing circuit through the strongly magnetized Wand. The handle contains a test tube filled with the 'nosode,' remedy, or even colored gemstones matching the color and energy of the chakra you wish to balance. (Chakra Disks shown above are sold separately in the Healthy World Store.) The strongly magnetized Wand amplifies your bioenergy field circuit. By simply waving the quartz crystal tip of the BioEnergy Wand at the point of stimulation (consistent with a quartz crystal radio receiver and transmitter) the therapeutic energy is delivered to that point. That energy is also transmitted into the recipients body, into their acupuncture meridian system, magnified and amplified by this equipment, your own personal bio-field, and your own heart-felt loving intention in faithful prayer to transmit miraculous healing. Furthermore, this system integrates other successful forms of natural healing, such as homeopathy and herbal medicine. You will join your personal loving 528 energy with the remedy frequency you've placed in the handle of this pioneering instrument. Then all that great healing energy will be transmitted through the powerful magnetic field at the heart of the instrument's coiled circuitry. All of this intelligent design generates healing energy transmitted into the recipient of this restorative blessing. In other words, this breakthrough in healing technology leverages your own body's bio-field (i.e., aura). This design supplements your own body energy, and positive therapeutic intent, by generating powerful magnetic fields generated by the instrument that your energy and intention directs into the patient, client, or blissful recipient. You choose the specific remedies that you place into the handle of this instrument. These can include homeopathic remedies, herbal formulas, Bach flower remedies, essential oils, colored gemstones and more. Altogether, you will be able to deliver more positive healing energy, coupled with loving intentions (resonating from your heart), transmitting the precise remedies for healing into the ailing person. This therapeutic system naturally prompts speedy recoveries from a variety of ailments. 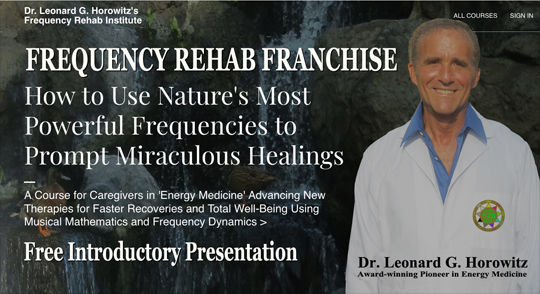 * It works using miracle-making knowhow that Dr. Horowitz teaches in his Frequency Rehab Course. In fact, he even teaches you how to manufacture these instruments at home! Register NOW! Dr. Horowitz's Course also trains you to start your own brand of BioEnergy healing products. These product are highly recommended for forward-thinking, entrepreneurial, health professionals, and owners of spas and gyms wherein you can offer and provide these natural healing services for a fee. And yes, making this purchase permits you do deduct your payment from the Course tuition. More information about this Course is linked HERE. Invest Only $1,500 to start your BioEnergy Wand healing practice today! *The BioEnergy Wand Technology is obviously not a drug, nor can it reasonably be misconstrued as a drug. It is not intended to diagnose or treat any kind of disease condition. It has not been evaluated or approved by the FDA. But it is intended, claimed, and experienced to produce relaxing, healing, pain relieving, energy balancing, and generally beneficial results during and after use. Click the button below to add the BioEnergy Wand Technology by Dr. Leonard G. Horowitz to your wish list.